Whether you’re working on a pet project, an explainer video or an assignment this post captures the best the web has in free sound effects and free music. I personally vetted every website to deem them to be of premium quality, but still, not all SFX and music was made alike. That’s just how it is. So I’ve categorised the websites below in order of personal preference. From the best free sound effects and music you’ll find online, to items that I would still consider of high enough quality to be used in my own projects. I’ve linked every listing here to the relevant Terms of Service page for each site. Usage rights will change depending on the website and author you download a file from so it’s wise to check before downloading anything. Having said that, I will broadly define the term ‘license’ in the sense which the websites below intend, before we get started. Regardless, I still encourage you to double check that individual sounds can be used in the way you wish, before using them! Alright, let’s do this. This flexible license sits between ‘all rights reserved’ and ‘no rights reserved’, and every website/author of a file can define it slightly differently. ‘No rights reserved’ is the license you’re shooting for, simply because it allows you to use, copy, modify and distribute a file for both personal and commercial usage, without asking for permission. ‘Some rights reserved’, however, probably means that attribution is required. If not explained on the download page, there will usually be a dedicated page explaining license policy for that website. To use a file, you may have to cite the author in the credit roll at the end of your video or provide a link on your website to the original website/author of the file. Last note: I want to keep this list fresh! So if you come across a dud link, let me know in the comments. Likewise, if you know of a valuable resource online that I haven’t listed here, feel free to leave a link in the comments. Audiojungle is in my opinion a top 3 marketplace for paid sound effects. They have some of the highest quality SFX on the internet. So why am I listing it here? Every month they offer a limited giveaway file – you can find a new download available from their website every month. It works for the author because they get more exposure, and it works for you because you get access to the web’s best quality sound effects. It’s worth noting that the entire platform, Envato, offers a free file from each of their marketplaces each month – illustrations, widgets, plugins, flash animations, the list goes on. Even if you don’t have a need for files there and then, I recommend grabbing them if they may serve a need in a future project. iStock (previously iStockphoto) is another one of my top 3 marketplaces. It is one of the most expensive platforms to shop but you get what you pay for. As with Audiojungle, you get access to one free file a month. Again, I recommend downloading files even if you don’t need them right then, so you can build a library of sound effects and form an asset for future projects. The video hosting platform, Vimeo, launched their music store in 2011 with the intention of providing a place where members could quickly find music for their projects. Rather than general music for listening to, ala Spotify, the music can be licensed – many tracks for free. Click on Advanced Filters > Price Range > Free to get the awesomesauce! Do note, however, that the free music generally can’t be used in commercial projects. 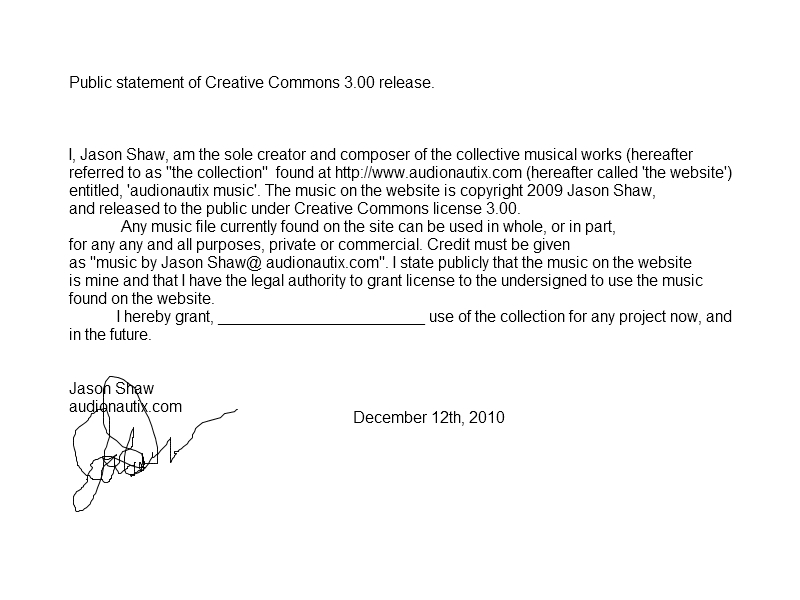 Most music is categorised in the Noncommercial Creative Commons license. If you find something that fits like a glove though, reach out to the artist personally to talk about your project. Musopen has an archive of wonderfully high quality free music tracks from over 150 composers. You can download up to five tracks every day for free. They are a non-profit with a mission to “set music free” and increase the exposure that talented composers get. The best thing, there are no copyright restrictions. If you search well, you’ll also find a treasure trove of free sheet music and textbooks too. Royalty Free Music hosts panoply of premium free SFX and free music for your “educational, personal and non-profit projects”. This is perfect for students and teachers alike for presentations or class projects, and a godsend if you’re tight for time! And if you’re creating a demo video for your non-profit organisation you’ll find an eclectic mix of sounds to suit the vast majority of causes – nature sounds, crowd sounds, documentary-style, news, corporate music. It’s all here. The community are encouraged to upload their own audio with a Creative Commons license, so make sure you pay heed to individual preferences before using someone’s work. What’s more, not all music is available for free so even more reason to read the attribution details. The Free Music Archive is, in their own words, an “interactive library of high-quality, legal audio downloads directed by WFMU, the most renowned freeform radio station in America”. Tonnes of value on this vibrant site with their policy of pre-screening curators before offering to the public. Tracks can then be searched for by curator (or genre). There is also a ‘community-generated’ component to the website, providing a familiar social media flavour but its strength lies with the experience and judgement that curators bring to the table. Whether you’re hunting for music to enliven your video project or add professionalism to your new podcast, you won’t be disappointed here. Given the breadth of content, there are several different Creative Commons licenses so have a read before downloading. Reassuringly, they pre-clear all tracks with the digital era in mind but still, many rights-holders means preferences change between authors within the Creative Commons framework. Sound Bible is a great, quirky, copyright-free place to build your personal library of SFX, with thousands of sound-bites, -clips and -effects. Files are either curated under the public domain designation or harboured under the Creative Commons license, and thankfully each is very clearly labelled for attribution requirements – if any – so you won’t have to scroll around. The free SFX can only be used in commercial projects if they are under the Creative Commons license or Public Domain. Royalty-free sounds must be paid for first. The community is thriving with many new sounds being added every week. Also of note is the 5 star voting system so you can filter out the best of what the site has to offer through the wisdom of the crowds. You’ll find everything from tool sound effects to coins being dropped to pans clanging. (The latter of which is great in cartoons for exaggerated impacts of all kinds.) Typically the Sound Bible audience is a student, teacher or “starving artist” so you know their heart is in the right place. Even specialised needs will be catered to here, for example game designers or … prank call recordings. Ahem. Ambience, animal, appliance, beeping, bells, buttons, crowds, drink, fire, foley – the extensive list goes on. If it’s just SFX you’re looking for, you won’t want to miss this one. You will have to sign up to SoundGator before getting access to their files but once you’re in, go crazy. With 23 (and counting) categories there’s a good chance of finding your boom, clang or tap of choice. Whether you need files or not, I recommend taking an hour or so to grow your library for future use. Mark my words, it’ll be real handy later on when you’re shoulder deep in editing and can just cycle through a folder of collected sounds in one place. These giveaways aren’t just a measly track or two, many collections amount to more than a gigabyte. So head over and grab some goodies, get some new gym music, and tell your friends about the up-and-coming talent! A Sound Effect is the, self-described, “world’s largest site for independent sound effects”. The site owner, Asbjoern Anderson, is a seasoned composer who has generously etched out a place on the interwebs to giveaway some of his work, as well as work from his contemporaries. This website serves as a central hub to distribute Creative Commons sound libraries which deserve a lot more attention. You’re getting just a taste of their best work for free and without audible watermarks, with the hope that one day you will return to buy a larger selection of their work. One pack given away at Christmas gushed, “over 130 sound effects for free. 2GB when uncompressed, or about 1.5 hours worth of sounds!” What are you doing still reading this? Your library won’t grow on its own! Music enthusiasts will be familiar with the Ableton brand, known for their digital audio software. What most people don’t know, however, is that they have a weekly #FreeStuffFriday giveaway where you can get your hands on some free sample libraries curated from their large community of musicians, sound designers and artists from around the world. If you’re an educator, student or business person, then you might find some value here as well. From week-to-week you’ll find anything from a collection of foley sounds, glitchy electronic effects, vintage drum breaks, and even quirky and completely original samples, “from the deserts beyond Dubai to the volcanoes of Japan”. Overkill to be sure for general demo videos, but could they take your project from good to great? You betcha. If you like the #FreeStuffFriday category, make sure you check out the more general ‘downloads’ category where you might find some other gems. Downloads are subject to a Creative Commons license unless stated otherwise by the author of the giveaway. “74MB of generous top notch cinematic sound effects from this artist” reads the description of this phenomenal freebie. 99 Sounds is one of those websites that you don’t just visit the once. That’s the reason you’ll see it make more than one appearance in this article. Giveaways are contributed by the community and hosted on the website, so this is just one of many packs that I suggest you check out. This pack is a generous collection of cinematic sound effects from artist Joshua Crispin (aka Generdyn). The futuristic sounds effects include impacts, risers, atmospheres and musical loops – perfect if you have a movie project in need of suspense. In terms of license, the samples can be used in both commercial and non-commercial ventures. The only condition is that the sounds aren’t compiled into a personal collection to be sold. This pack on 99 Sounds is a must if your project happens to be horror-themed. “The Warehouse” features a panoply of spooky field recordings created in an – appropriately – abandoned military storage facility. Richard Gould, the talented composer from London, brings together a range of wooden, metallic and glass SFX tainted with the organic ambience of the warehouse for extra ghoul points. Even if you don’t need horror sounds, you may still want to check them out. If you’re working on a cartoon, or looking for an unexpected or funny change of tone in your boring presentation, some of the sounds might just make your project more memorable. Free sound effects, music loops, background music, what’s not to like? Well, that depends on what you think about oranges. Seriously though, a lot of value here. I actually found this resource via a Japanese website, kinda random actually. But I’m glad I did. No sign up required, no hidden expenses, just find what you’re looking for amongst the growing archive of sounds and build your personal library of SFX and music. Nature sounds, animal sounds, drum loops, comedy sounds, the obligatory cat meowing, the list goes on. The site owner Alex, mentions that his site is used by everyone from sound designers, home video makers, web designers, video game developers, documentary filmmakers. And if you’re a teacher, a student, or a business person looking to create a 3D demo video, then there is a very good chance that you’re going to find what you’re looking for here. This 32MB goody bag is free to download and royalty free so you’re able to implement them into your own projects without licensing problems. You’ll be able to experiment with mysterious creatures, unsettling screams, various impacts and music. “Wa wa wee wa” as Borat would say. This takes the cake. The above 99 Sounds packages were from solo artists, this is the whole nine yards. Weave your way through a boatload of samples from the international community. You’ll get your hands on diverse libraries such as atmospheric soundscapes, funky glitched sounds, alien noises and electronic drum loops. And remember, if you like some of the files, get in touch directly with the sound designer and see how you could work together on your project. You might even find that you live in the same city. I hand picked this one because it’s so flexible for the diverse group of people who will read this article. The pack contains 99 separate drum samples in 24-bit WAV format and have been recorded with professional audio gear from both analogue and digital sources. This comprehensive package is the result of 12 months work, and you’re getting in for free. They’ve even been normalised so less editing work for you. If you haven’t visited 99 Designs while reading this article yet, it’s prime time. Free Sound has been on the block for a while, but there’s a good reason for that. They have tasked themselves with the mission to create a mammoth collaborative database of audio snippets, samples, recordings, bleeps and anything else the creative community can cook up. Every file displays meta information for the number of downloads, a 5 star review system, and even comments, so you can separate the wheat from the chaff pronto. There’s even a novel search facility where you enter terms such as, ‘sounds like’ to find that tip-of-the-tongue effect which just escapes you. The platform is used by artists, educators, students, business owners and even audio research institutions to “test their algorithms”, the site explains. The creation of Alan Mckinney of Mckinney Sound, Free SFX’s reason-for-being emerged from a desire to bring together the work from many unsung heroes of the audio world. Fortunately, the sound designers he contacted about hosting their recordings on his website concurred. They get much needed exposure, while you get to knock the crowd’s socks off with your production’s sound track. To keep things simple, every contribution must accept the license agreement of Free SFX, which is that the sounds are available to be used by anyone in their projects. 2000 free sound effects here, so you know they aren’t playing. AudioMicro was founded in 2007 and has grown to a sizeable marketplace with more than 4 online brands. And their client roster isn’t so shabby either, having provided assets for Microsoft, Cisco and the Discovery Channel. Those 2000 sound effects aren’t the entire library, but a thin slither of the premium pie, as they make money through their larger paid-for library. They have a generous collection of free animal, cartoon, transport, home and musical instrument sounds, as well as other miscellaneous effects which could just fit the bill for what you’re looking for. Like many of the websites in this list which offer free SFX to the public, the files on offer here are not exclusive, can be found elsewhere on the web, and are not in the ownership of Partners in Rhyme. The value, then, comes from the curation of valuable resources, and this website is no different. You’ll find anything from the pitter-patter of rain hitting a roof to the futuristic aura of a city from the future. Whether you’re creating a short film, an animated 3d demo video or looking to refine a documentary, you’ll find something on offer here. When looking for sound effects, not many people immediately think of YouTube as a place to go. Yes, it could be a licensing nightmare, but also, sound effects aren’t exactly video. Fortunately, YouTube is a great place to upload MP3s, and its huge community means you can find a mind-blowing array of effects. To avoid the licensing issues make sure you frequent only channels which are dedicated to providing SFX, and have a good reputation. One of those is the Audio Library, which caters to predominantly YouTube content creators but of course, anyone else on the prowl for sounds. You’ll be able to find the music within the ‘Free Music’ tab, so it won’t be followed up through Content ID protection. Do note that the quality does fluctuate a bit, perhaps to be expected for a channel on YouTube. But overall the quality is very good, with many files having been produced at 320kbps. Flash Kit is a self-described, ‘ever growing list of shareware and freeware Sound FX for download’. Content providers submit their own work to build their brand, and so there’s an incentive to provide the best for free. Win! Freeware: allow anyone to download as they please. Linkware: allow usage in return for a link to your website. Shareware: increase details in the description for usage. Media College presents a broad spectrum of free sounds, all of which are free to download. There is one interesting distinction to keep in mind. Sounds that are labelled as ‘Full Permission’ have been recorded by the website’s staff and released with no conditions. (Exempting the obvious ‘don’t resell’ label.) So you’re free to use those sounds in any commercial or non-commercial project. I do recommend that you still read their terms on the website, however, as they may change over time. Another notable difference here is that they have a facility for you to donate reasonable amounts to the authors, which is a nice touch. Starting off here with GR Sites, the files can be used for personal projects but not commercial. For that, you’ll have to purchase their commercial license which you can read about on the license link above. Just be aware of that before diving in with open arms. There are a nice selection of categories to choose from. Aside from the common animals, birds and nature the files that make GR Sites worth visiting might be recreation, the office and water sounds. Stock Music Boutique doesn’t seem to be very well known, I only came across it through a passing comment – probably much the same way you’d hear about any self-respecting boutique whether online or off, to think of it. It’s pretty new, having been established in 2010 from London, and offers visitors premium production pieces that are first pre-screened for quality, and can be used with the Creative Commons license in mind. Even as a relative newbie to the market, they list prestigious clients such as the BBC, HBO and Channel 4. Definitely worth making some time for! Free Sound Effects is like a little market stall with a modest stock take, but stock that you come back to week after week nonetheless. The license is very lenient, as they say themselves, “you can use our sounds for almost anything you can think of”, whether that’s in your demo video, short movie, presentation, or classroom piece. A golden nugget of a suggestion is using their sound effects in a theatre performance or art gallery piece, something that I hadn’t thought of before. Notable categories include religion and ceremonies, fireworks and camels. SFX Source is another marketplace with a small section for freebie sound effects. When I say small though, don’t read too much into that until you’ve checked them out. The one condition is that the freebies are only available in .MP3 format which any audiophile does well to avoid. Better quality .WAVs are available at a cost. But as I explain in my teaching, unless you’ve been commissioned for expensive client work or the equivalent, it’s possible to get away with lower bitrate audio for SFX because they can be edited at a lower volume compared to music – which, incidentally, you can add if you’re really that concerned. If you’re reading this article, you’re probably creating on a budget, and so an .MP3 isn’t going to have you struck by lightning. If SFX sites could win a prize for being the most innovative platform, then Soundboard might just take first place. Corollary to innovation, the website was originally designed for a different purpose in mind; as a small desktop application where users could download, store, manage and listen to short sound bites. Along the way though, they decided to take quite a passive idea and encourage the community to create and customize their own soundboards – like a blank canvas. What does this mean for you? Users on the website can create their own sound playlists and open them up to the public to access. However, it’s worth becoming familiar with the terminology used on the website, namely the difference between private and public boards – not accessible to the public vs accessible. As for licensing, the website states that the sounds are posted for entertainment purposes only, so generally speaking you won’t be able to use the sounds in commercial projects. However, appraise files on a case-by-case basis by reading author descriptions. Since 2001, Pac DV has been producing royalty free sounds for a whole host of practitioners and companies. Generously, the team launched a website to host a fraction of that work for free to cash-strapped artists and entrepreneurs alike to use in their projects. On the Creative Commons license you’re entitled to freely use these in your video, film, audio and multimedia projects, but avoid compiling a collection to resell, of course. Head over, and look into some great work delivered straight from the horse’s mouth! If you visit an SFX site, you can bet your bottom dollar there will be a category for animals. There just will. It’s just the way it is. Well, early on Memozee got on the animal train and couldn’t get off. The website is dedicated to animal sounds. Need a yellow bellied sapsucker? Done. A chinchilla madbaby? Got you covered. What about a yeti? Actually, couldn’t find that one, but most fairly well known animals make an appearance here. One important thing to note here for the images specifically, most have permissions to be used freely on the Creative Commons licence. But the webmaster acknowledges that it’s possible there are still some copyright violations on some of the images. This can be translated to the SFX as well, so be careful before using. Sound Jay is another respectable free SFX provider with a sizeable library. On the homepage you can see all of the categories clearly labelled, with the typical human and transportation sounds, but also less typical communication sounds providing sound effects for writing and typewriting. The website says that most audio tracks are 16 bit stereo and either 44.1kHz or 48 kHz so most files are going to be passable for a project on a budget. But remember to read the TOS for individual files before using them. Audio Nautix is the love child of a single artist, Jason Shaw. All music tracks are available on the Creative Commons license, and you’re free to use them in commercial and non-commercial productions alike, providing there is attribution to the website as a way to say thanks. If you’re using the sounds in a video project and can’t offer a link, it’s suggested that you credit the website with a statement like, “music by audionautix.com” – for example in the credits roll at the end of your piece. Grooving, soothing and bright. Somber, pensive and melancholy. You’ll find a veritable trove of music here to give your video some emotion.